The students of Punjab’s government schools, Aanganwari centres and Balwadi centres would be provided quality packed food of Markfed under the Mid Day meal scheme. A pilot project in this regard is being started in two blocks of the state from January 1, 2019 onwards and if the scheme is successful, it could be extended to other schools of the state as well. The main aim of starting this project is to provide good quality and nutritious food to the students. This was informed by Punjab State Food Commission member Mr Gursandeep Singh Grewal while reviewing the progress of Mid Day meal scheme as well as distribution of food grains under the PDS. While providing further information, Mr Grewal informed that the Punjab State Food Commission is reviewing the progress of Mid Day Meal scheme and distribution of food grains under PDS in the entire state. He said from January 1, 2019 onwards, students in Punjab’s government schools, Aanganwari centres and Balwadi centres in two blocks of the state would be provided good quality and nutritious packaged food of Markfed. He said that due to the efforts of Punjab State Food Commission, this pilot project would be started in 25 each schools/centres in two blocks (one rural and one urban) from January 1, 2019 onwards. He further stated that these packaged products would be completely cooked and would just have to warm them before serving to the students. Similarly, the manpower required for preparing the Mid Day Meal would also decrease considerably, the burden on teachers would also decrease and the income of Markfed would increase. He said that Markfed would prepare this packaged food keeping in mind the nutrition required for students in their physical and mental growth. 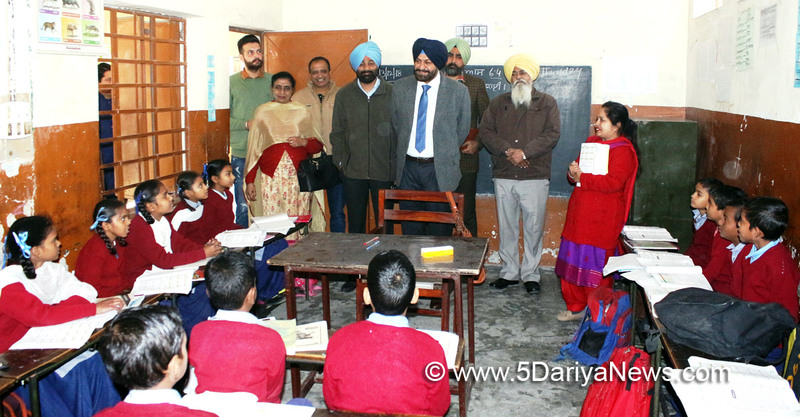 On this occasion, Mr Grewal also visited some schools and Aanganwari Centres and checked the quality of Mid Day Meal there. He also took feedback from the students. He also directed the officials to ensure that the Menu boards and Food Safety Act guidelines should be displayed in the school premises. He also directed that the monthly report of food being served should also be sent to the commission without fail.He directed that all complaints related to food products should be dealt by the senior officials on priority basis. Additional Deputy Commissioner (General) Mr Iqbal Singh Sandhu informed that till date, 28 such complaints have come forward in Ludhiana district, that have been disposed off as per the Act.Mr Grewal clarified that cleanliness should be maintained at all costs while preparing and serving the Mid Day Meal and the commission would not tolerate any discrepancies in this regard. Prominent among those present on the occasion included District Food and Civil Supplies Controller Mr Rajinder Beri, District Programme Officer Mrs Rupinder Kaur, District Education Officer (Senior Secondary) Mrs Swaranjit Kaur, Senior Congress leader Mr Ranjit SinghMangat, besides several others.